It’s been quite a while since a new writing tool has found its way onto my devices. Writer has been my tool of choice for quite some time (unless you include my dalliance with Writer Pro … but that was short lived and I almost lump the two together). Happily. It always met my needs and I was never tempted to try the favourites of other people (Byword for example). However, I finally took the plunge on Ulysses. And I’m glad for it! This is not a full fledged app review, but a collection of things I like about the app. First, as mentioned above, it’s very flexible, yet also very powerful. You can easily configure it to be a very sparse writing environment by hiding the additional panes. Or, you can use the full screen view for an even more immersive experience. Beyond that, the way you manage your articles appeals to me. Where as Write (the Notes app I’ve mentioned lately) keeps everything available in a sidebar, but truly never feels like a comfortable Mac app, Ulysses seems to get the details just write. 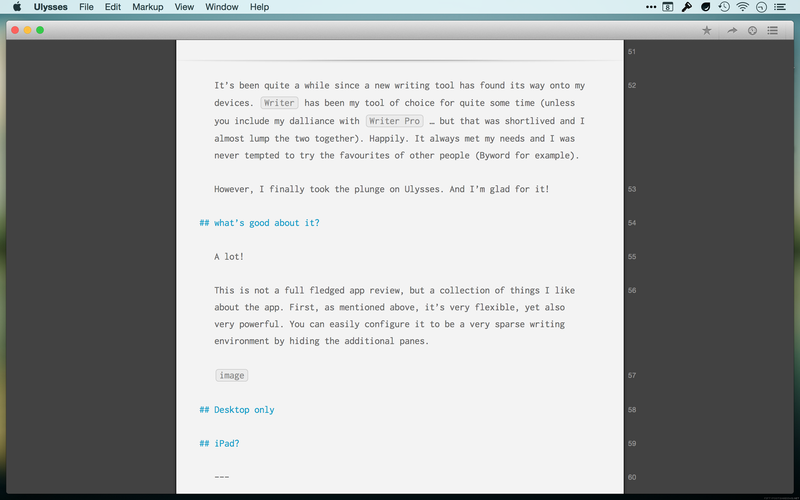 Beyond that, Ulysses feels like a Mac app and Write does not … long time Mac using software fans will not this feeling. Even as I typed that, I recognize it’s hard to describe why one feels right while the other does not. For me, it’s most likely because the sidebar approach in a Notes app needs to allow me to see the details of each note, otherwise I end up clicking around to try and find the correct entry. Whereas with a writing app, I don’t need to see the details, usually just the title, and I can find what I’m looking for. I am able to save files locally, or in iCloud. I can group articles in the sidebar, but that grouping is not reflected in the OS X file system. At least, not that I could find. This means I can organize my writings for my blog, plus my notes for work, in their own groupings. If one were to write a book, this would also make a great way to organize your chapters and research easily. Flexibility! One thing: Ulysses calls each “article” or “file” a sheet. Sheets can be stored under a parent group. 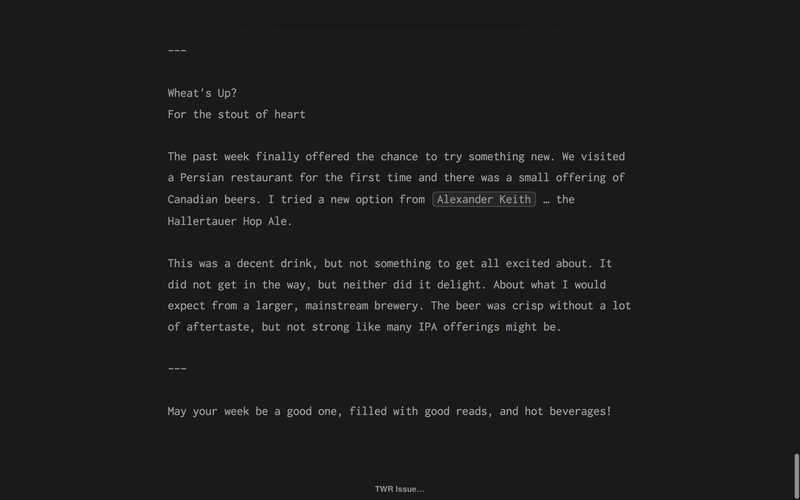 Now, an app like this has to nail one thing: the writing experience. Ulysses does, whether in full screen or not. 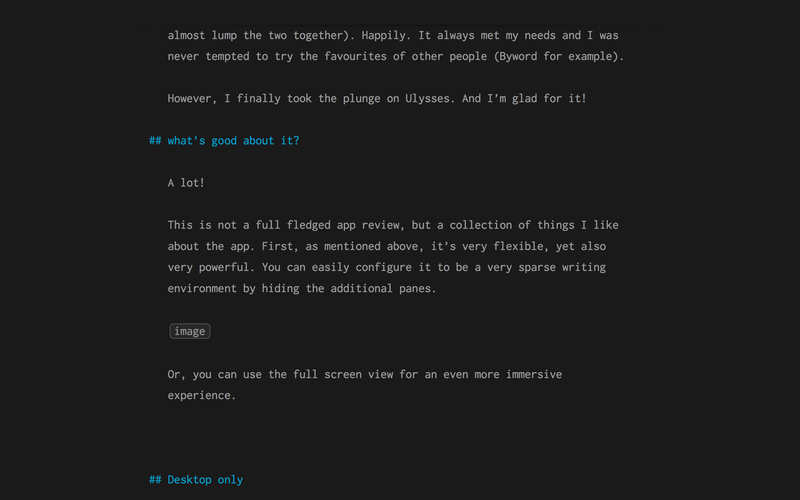 Like iA Writer, Ulysses does a great job of highlighting Markdown items. The colors look great and allow you to easily distinguish different content. Links are nicely highlighted and the URLs hidden. The spacing of the text is spot on and you can choose the font you desire. Full screen mode takes the current sheet and displays it full screen with a dark background. The nice touch here is that you do necessarily not need to exit full screen mode to navigate to another sheet. You can scroll to the top of bottom to move to the previous or next sheet in the current group. All in all, there is a lot to like! My first thought was to try this on my iPad as well. But it turns out there is no Ulysses for iOS. Instead, they have an app called Daedelus Touch. I haven’t heard much about this, nor have I given it a try yet. I may though — it would put the iCloud Drive aspects to the test (I’m not sure I trust Apple with this yet, not like Dropbox). Currently, if I were to start an article on my iPad, I would have to create it in Writer, then copy and paste the content from a Dropbox file into Ulysses on my Mac. But honestly, my iPad continues to evolve into a device most used by children. I rarely put it to use myself these days. Update: I was kindly informed that you can add External Sources in the Ulysses sidebar. Fantastic — articles started on my iPad are available for editing at a later time. Apart from the primary features, there are some other interesting options available for this app. Again, these are not features everyone would need … but they can add value. One item I like is the easy access to the stats for a given sheet. You get a nice overview of the characters and words in the sheet, as well as an estimated reading time. Beside the button for stats is a button that allows you to quickly move from section to section in your sheet. A great option for longer pieces. As well, there is a sharing button that makes it easy to perform various actions with other apps on your computer. For me, setting Droplr as the default app or service makes it easy to share a piece I’m working on. Truthfully, the Export options for this app are the best I’ve seen. Ulysses seems to have been created with the understanding that your words are your words and getting them into another app, service, or location should be as easy and as painless as possible. Smart move! To finish, what would make me switch from using one writing app to another? Look and feel are important to me when writing. Ulysses and iA Writer both do this well. But I must admit I like that Ulysses allows me to organize my writing, as well as write. Where iA Writer has to be used in tandem with Finder, Ulysses works on its own. Scrivener has long been the tool that people recommend for writing long content on the Mac. We’re talking novel length work. But seeing as Scrivener is a bit odd in terms of UI and seems to be updated infrequently, I can see Ulysses challenging in this arena. Ulysses nails the Markdown experience and gives a very solid document management toolset as well. Although I switch tools far less often than I used to, it still happens. In this case, it feels like a change for the right reasons.